Download a printable reference of the Different Types of Cost Sharing also shown on this page. Read about the Cost Sharing Terminology and eRPM Changes! Cost sharing is the financial and non-financial support contributed by U-M to sponsored projects. Compliance with federal cost accounting standards requires that cost-shared expenses be treated in a consistent and uniform manner in proposal preparation and in the accounting and reporting of subsequent expenses in the financial reports to both federal and non-federal sponsors. Cost sharing is generally the responsibility of the U-M unit(s) proposing the work. In some instances, however, cost sharing may come from a number of sources, including other units, colleges/schools, central administration, and third parties. The general practice of U-M is to provide cost sharing only when required by the sponsor and only to the extent necessary to meet the sponsor's specific requirements. 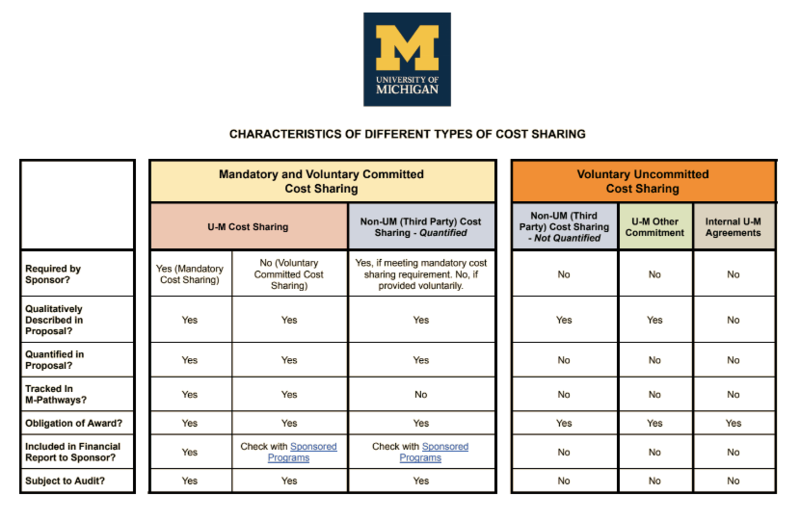 U-M Cost Sharing (also known as Mandatory or Voluntary Committed Cost Sharing) occurs when U-M states in a proposal that it will provide a specific, quantified resource without asking for funding to cover the cost. Examples include 10% of a faculty member's effort, $5,000 in research supplies, etc. U-M Other Commitments (also known as Voluntary Uncommitted Cost Sharing) occur when U-M states in a proposal that it will provide a resource to the project but the item is unquantified. Examples include unspecified faculty effort beyond what is budgeted and accounted for in the proposal, running samples at no cost and without mentioning value, etc. Internal U-M Agreements occur when one or more unit(s) of U-M make(s) a commitment to provide a resource if the project is funded, but the arrangement is not referenced in the proposal and has not been shared with the sponsor. Examples include, if not mentioned in the proposal, provision of additional lab space, coverage of fringe benefits that the sponsor will not fund, etc. Non-U-M Cost Sharing and Other Commitments occur when a proposal includes contributions from an entity external to U-M (also known as Third Party Commitments). The contributions may be quantified in the proposal or may be unspecified. Examples include a local community organization's commitment of volunteer time, a corporation's donation of a $10,000 piece of equipment, etc. sharing requirement. No, if provided voluntarily. Included in Financial Report to Sponsor? Cost sharing that is quantified, regardless of whether it is being provided as U-M Cost Sharing or Non-U-M Cost Sharing, is subject to audit and is a condition of the award when included in a proposal or an award budget. It is most important, therefore, that any cost sharing commitments be reflected in the project accounts once an award is received. Cost sharing requires the prior approval of the U-M units providing the cost share before the submission of a proposal to the sponsor. Project Directors are urged to discuss proposed cost sharing well in advance of the submission deadlines to avoid "eleventh-hour" problems and misunderstandings. Cost sharing must be documented whenever it is a stated requirement of the sponsoring agency or is quantified in the proposal or award. U-M will consider committed cost sharing to be mandatory if it is explicitly identified in the proposal or is required as a condition of the award. The Project Award Notice (PAN) will reflect the U-M's committed cost sharing to the project. Cost sharing commitments for faculty and staff salaries, benefits, materials and supplies, travel, printing, and other operating costs should be recorded in a cost sharing account. Cost sharing commitments in support of graduate student tuition and fees and equipment acquisitions should be recorded in the sponsored project account (unless other arrangements are made). The portion of these charges that represent U-M cost sharing will be transferred to the appropriate U-M account. 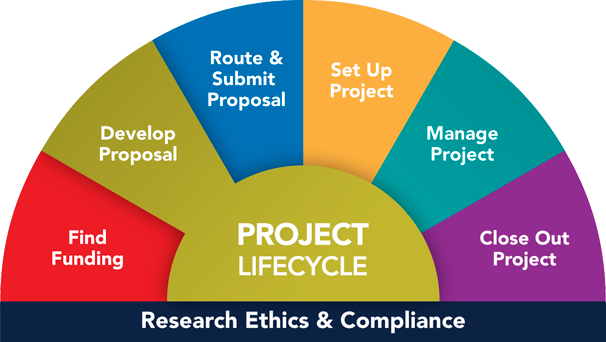 For example, the Project Director has committed to cost share 15% of his or her academic appointment in support of a sponsored research project. This commitment should be charged to the assigned cost sharing account. If the cost sharing commitment is to provide partial tuition support for GSRA's assigned to the sponsored project, the full tuition charges should be made to the sponsored research project and the cost shared portion of these charges will be transferred to the appropriate U-M account. Cost sharing commitments for equipment acquisitions should also be charged to the sponsored project account and funds transferred into this account from the appropriate cost sharing sources. Departments/units are responsible for designating on the Proposal Approval Form the appropriate amounts and sources of cost sharing. The account number(s) for U-M Cost Sharing will be provided at the time an award is received and a sponsored project account is established. Any time and effort of the faculty and staff designated as part of U-M Cost Sharing will be monitored. Funds will be transferred from the appropriate sources (e.g., general fund accounts) to cover the actual expenditures recorded in the cost sharing account. The department/unit is responsible for ensuring that faculty and staff appointments are submitted on a timely basis. These procedures will ensure that all of the project costs--those costs covered by the sponsor and those committed by U-M as cost sharing--are recorded in the sponsored project account and the associated cost sharing account and reflect the budget commitments approved by the sponsor and agreed to by U-M at the time of the award. This consistency between budget commitment and expenditures is essential to ensuring compliance with the cost accounting standards. (7) Conform to other provisions of this part, as applicable. While the rules for what constitutes allowable cost sharing do not change, the cost sharing requirements of individual sponsors may vary. For example, some sponsors may require a 1:1 match. Others may specifically stipulate that cost sharing is not required. Some go so far as to say that cost sharing may not even be proposed. 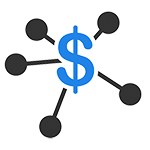 Industry sponsors generally do not require cost sharing. Nonprofit organizations will often seek cost sharing by declining to pay certain costs (e.g., faculty time, staff benefits, indirect cost, etc.). For information about U-M general practices concerning cost-sharing, contact your Research Administrator. If you don't know who that is for your unit, you can look up your Research Administrator in our Blue Pages.